The first homemade chocolate cheesecake recipe from scratch is outstanding. I love Dorie Greenspan and these recipes are from her cookbook - Baking, From My Home to Yours. Pick up a copy; you will love her as much as I do. Imagine this creamy, rich chocolate enveloping your mouth - like heaven on a fork. Seriously. A must try. The Kahlua is optional but so worth it. Whip heavy cream and powdered sugar until it stands (and stays there). Add the dissolved coffee and gently mix together. It's ready to serve. PREHEAT oven to 350 degrees. Butter one 9 or 10 inch spring-form pan. Combine the chocolate graham cracker crumbs, softened butter, 3 tablespoons white sugar, and the cinnamon. Mix well and press mixture into the bottom and up the sides in the prepared spring-form pan; set aside. In a medium bowl beat the softened cream cheese until smooth. Gradually add 1 cup white sugar mixing until well blended. Add eggs, one at a time and beat after each addition and then mixing on low speed until very smooth. Melt the 8 ounces semi-sweet chocolate in the microwave. Add the 2 tablespoons whipping cream to the sour cream and stir well. Add chocolate to the cream cheese mixture and blend well. Stir in sour cream mixture, salt, coffee, 1/4 cup coffee liqueur, and vanilla; beat until smooth. Pour mixture into prepared pan. Fill a oven proof pan with boiling water and place in the bottom of the oven; this is a water bath. Bake the cheesecake in the center of oven for 45 minutes. Center will be soft but will firm up when chilled. Do not over bake. Leave cake in oven with the heat turned off and the door ajar for 45 minutes. Remove cake from oven and chill for 12 hours. After the cake has been in the refrigerator overnight, early in the morning made the glaze. In a small saucepan add the heavy whipping cream and chocolate. Heat on low until the chocolate morsels are melted and add the vanilla extract. Pour over chilled cheesecake (while it is still slightly warm) and spread evenly to the edges. Chill for at least 4 hours. Just before serving, sift a little cocoa powder lightly over the cheesecake and top with a mound of coffee-flavored whipped cream. Sprinkle with the shaved chocolate. They will beg you for the recipe. Honest. 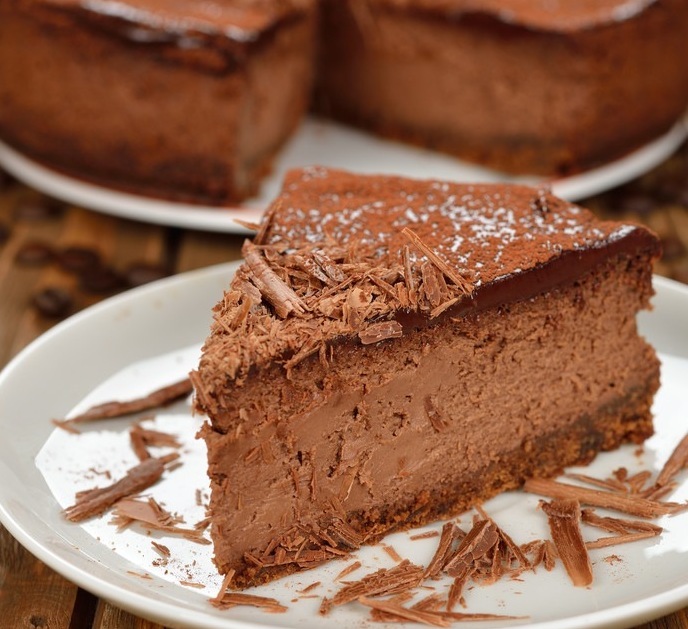 This chocolate cheesecake tastes like a slice of heaven. It has a creamy texture with undertones of white chocolate and topped with fresh raspberry sauce. It tastes like it was professionally made. Mix the ingredients together. Spray the bottom of a 10" spring-form pan with vegetable oil and add parchment paper to the bottom and also spray the parchment paper. Press the oreo crumb mixture into the bottom and up the sides of the pan. In a blender, puree the raspberries with the sugar. Push to a fine mesh sieve to remove seeds and add the cornstarch and water. Bring to a boil and stir sauce until thick. Remove from heat and when cooled down, chill it before you serve it. You may use 5 tablespoons of this sauce in the filling before baking. Melt the white chocolate chips in the microwave with the heavy whipping cream on high for 1 minute. Remove and stir well. Place back in the microwave for another minute and repeat until it's melted. In a large mixing bowl, whip the cream cheese until light and fluffy. Add the powdered sugar and mix well. Beat in the eggs, one at a time, and mix completely after each addition. Now add the vanilla and melted white chocolate mixture; mix well. Pour 1/2 of the batter into the crust and add 1/4 cup of the cooled raspberry sauce evenly over the filling. Pour in the remaining filling and top with 1/4 cup of the raspberry sauce. Use a knife and swirl the batter with the tip to create a marbled effect. Bake the cheesecake in a water bath for 55 to 60 minutes, or until filling is set. Remove from the water bath, carefully loosen the sides of the cake with an offset cake knife. Cool, and immediately refrigerate - uncovered - until morning. No cracks. To remove the cake from the pan, heat water to almost boiling and gently dip the pan in (about 1") for 10 seconds. Turn the pan over on a large flat plate, tap the bottom and lift the pan away from the cake. Invert cake onto serving plate. If cake stays in pan, repeat the process. The cheesecake will not fall. Serve with remaining chilled raspberry sauce.